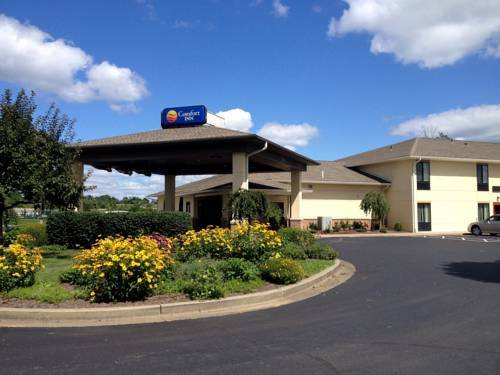 Get everything you need to be at your best when you stay at our Comfort Inn hotel in Dover, OH. Our smoke-free hotel is near the areas top attractions, including the Warther Museum, Ohio Wineries, Pro Football Hall of Fame and Dover Chemical. Each guest can enjoy our free breakfast, free WiFi, fitness center, laundry facility and valet cleaning service. Unwind in one of our guest rooms, all of which feature a TV, hair dryer, coffee maker, iron and ironing board. Sign up today for our Choice Privileges program and start earning rewards points with your next stay. *Some amenities may require an additional cost. This is a 100 percent non-smoking hotel. Pets are not allowed on property. Credit card authorization and valid ID are required at check-in. Animatronic robots of President William and First Lady Ida McKinley exchange banter as visitors tour a gallery that displays the President's secret step-up stool and a replica of the gun that killed him. "Big Muskie," the world's largest earth moving machine, was dismantled in 1999. But you can still visit Big Muskie's humongous bucket!